Some of you may have been able to avoid hearing about the Patriots perfect season, but I'm afraid it's happened and it can't be denied. Do you want to know who denied it? My friend Beau. You see, we bet on the Patriots going 16-0 and he lost. The wager? A pie from the House of Pies. Below is a picture of me and my pie. 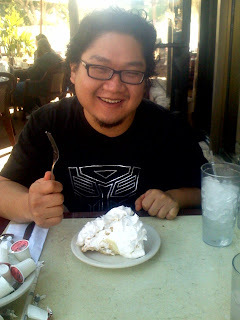 Notice how happy I am with my pie. It's a bananna cream of victory. Now let's take a look at the loser's pie. 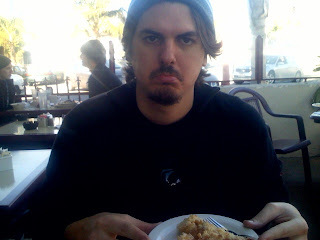 An apple pie of crumbling discontent if I've ever seen one.